Hey look, some finished knitting! This is the Blackrose pattern from Knitty, and guess what? 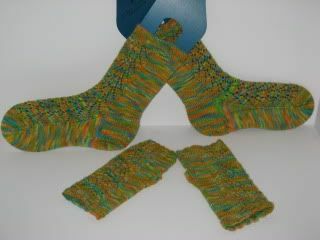 One skein of my sock yarn was plenty to make both socks and the wrist warmers. Which I kind of figured seeing as how, you know, I'm in charge of the yardage and such on them – but still. There's being pretty sure it has that kind of legs in it, and then actually having enough to finish them both. 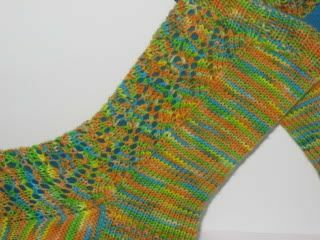 I think if I were going to do these socks again, I would do two things: I'd use a darker variegated (or solid) (you know, like the designer recommends, ahem), and I'd throw in an extra repeat or two of the pattern on the leg. But that's because I like longer socks, and now I know I'd have enough yarn to do it, if I had yarn that was on the "generous" side of the yardage scale. This was another good pattern – not too hard, not mind-numbingly simple (like the men's socks I'm making right now for my husband, with the straight stockinette for approximately eighteen feet around and around and arounzzzzzzzzzzzzzz…). It has a great combination of "pretty detail" and "letting the variegated do its thing," which was what I really wanted for these. That's right! keep on trying! I know how hard it can be. I tried at least 10 times to get the cabling bobble combination right for a strip that is supposed to be for a sweater I'm designing, based off a sweater I found in Washington (the state). I'm still not entirely happy with the result, but sometimes, you have to just go with it. I'm sure the cable-bobble strip will warm up to me, as the lace will to you! good luck! PS: You wouldn't guess what the word verification says: "ballses". Me thinks they're channelling a knitter. Thanks for the nudge. I was looking for a pattern to knit for our youngest daughter's August birthday. This should please! I've been seeing a lot of these lately! Yours are great! Can't wait to see what you end up designing! Vomiting bats and bloated sheep? Sounds like Halloween socks to me. Maybe you just don't realize what it is you're actually designing....that whole "creative process" thing again, you know. Sometimes it sneaks up on you.